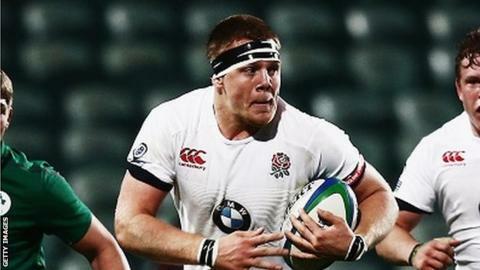 Northampton Saints have signed England Under-20 tight-head prop Paul Hill from Yorkshire Carnegie. Hill, 20, is widely-regarded as one of the most promising forwards to have come through England's age-group teams. A Junior World Championship winner in 2014, Hill started four of England's five matches in their recent Under-20 Six Nations-winning campaign. Northampton director of rugby Jim Mallinder described Hill as "a tremendous prospect". Hill has been a regular in Yorkshire Carnegie's Championship campaign, playing 16 times in all competitions this season. Mallinder continued: "The Championship is a tough league to play in and he will have learned a lot playing against some experienced players. "We believe he has the ability to make the next step up in his career and, given the huge interest he attracted from the Aviva Premiership's top clubs, we are delighted that he has chosen to take that step with the Saints."